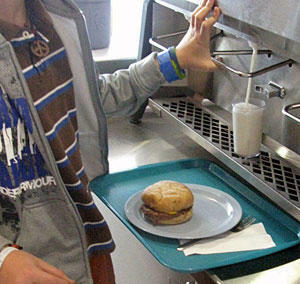 Lunchtime at Casey Middle School, and kids were jostling in the food line: giggling, pushing, horsing around as usual as they waited to be served the day’s entree — a choice of hamburger or a plate of either beef or vegetarian bean nachos. Some students who’d already passed the cash register with their food stood in front of a bank of microwave ovens determined to add a finishing touch to their plates of corn chips topped with grated cheese. “We like to melt the cheese,” one girl explained. That would be the first clue that something very different is happening these days at Casey and the other 47 schools in the Boulder Valley School District. As recently as two years ago, the cheese on those nachos would have been the processed liquid kind poured out of can. But then just about everything in Boulder’s cafeterias has radically changed since Ann Cooper, the famed “Renegade Lunch Lady,” took over food service here in fall 2009. Gone are the chicken nuggets, Bruno’s pizza, potato chips, Eskimo pies, and other school lunch staples of the past. Chocolate milk and “energy drinks” also have been scratched from the menu. No more Otis Spunkmeyer muffins, “super doughnuts,” or breaded cheese sticks either.